Since I was young I have loved the night sky, gazing up at the lovely stars. Years later when I had the opportunity to be outside in a small village and the Bush of Botswana, I realized that until then I had never seen true night. Not only were these stars of the Southern Hemisphere different, but there were so many more. I was bathed in their glow and I found that I could even see the Milky Way, something that prior I had never comprehended. Yet even then, there in the heart of Africa, light pollution was evident, blazing along the horizon from distant mining industry. 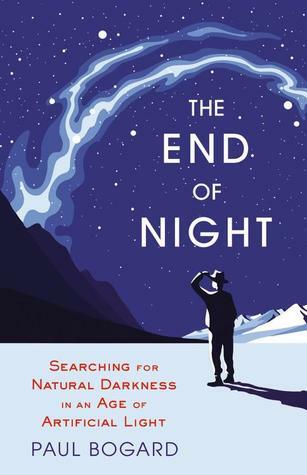 The End of the Night talks about light pollution, about how most people are born, live, and die without ever experiencing an actual night, actual darkness, free of artificial light. I was aware of the effects of modern electric light on star-gazing, and even a bit on its adverse health effects, but Bogard takes the story far beyond these issues alone to shed light into all aspects of darkness, literal and even figurative. Bogard writes both well and passionately, suffusing the text with a glow of caring and hope, even amid factoids that can be downright depressing regarding how ubiquitous and how horrible our way of artificially lighting our lives is done. The book is about light as much as it is about darkness, starting at one of the brightest spots on Earth, Las Vegas, and slowly counting down chapter numbers, dimming the focus on light and raising the focus on dark to the final reflections in quiet blackness. After the initial astronomical discussions, Bogard turns to examining how two large European cities, London and Paris of course, have utilized light in different ways, with very different effects. He addresses the issue that most lighting we use is too strong and too wasteful, both economically and energetically. He discusses findings that demonstrate that all this light we clamor for in fear, all in the name of ‘safety’, actually has the opposite effect. The most interesting chapter occurs halfway through the book with exploration of light and darkness in the metaphorical sense, and the psychological needs we humans have for darkness and for both sides of related things characterized so dualistically. Another chapter focusing on what people can do to change how we misuse light and foolishly banish darkness completes the tour of this book, leaving the last chapters almost like an epilogue, finding bits of darkness still close to home, and hope that it will still exist in the future, perhaps even return to our daily lives. Riding the bus while reading this I noticed all the lights blaring inside, lights still on outside in parking lots, lights shining from cars…all while the Houston sun blazed down. This book opens your eyes to the lights that blind us. I’d recommend it to all to read.